You Already Have a Brand. Here’s Why You Need an Agency. Your brand is your baby. It’s one of a kind. But it’s also in competition with a lot of other…um, babies. So how do you get your brand to stand out? The answer begins with establishing a solid brand identity. More than just a catchy tagline or a recognizable color palette, a brand identity is the lingering impression you want to leave in the minds of your audience. Building that impression requires creativity, of course. But it also takes consistency. The way your brand talks about itself and the graphics it uses to convey that message need to be uniform across all communication channels. Otherwise, your brand message and personality become muddied. Creating a consistent brand identity is something that a branding agency does well. Sure, you could always hire an individual copywriter, designer, and developer and cross your fingers, hoping that the resulting creative somehow feels cohesive. But chances are, operating in this manner is going to miss the mark. We have a proven process for developing recognizable brands. We start by conducting branding workshops that identify the issues that matter most to your customers and discuss how your brand uniquely addresses these needs. We use the insights derived from these workshops to create a brand narrative and positioning statement, which informs everything we create from that point forward. It’s a challenging process but an exhilarating one that our clients love being part of. Want to take your brand to the next level? Contact C2 Creative about creating a brand identity. Congratulations! You’re expecting a brand! During these exciting gestational months, you’ll be addressing a lot of important issues—brand positioning, target audience selection, and value propositions, to name just a few. Discussing these issues requires a team approach. But is the team you’ve assembled inclusive enough? Inspire you to think differently. When your job revolves around a single brand, it’s easy to get caught in the trap of focusing too much on the brand itself and not enough on the customer. Working with an outside agency can help force you out of that rut. Gaining different perspectives from cross-functional teams is critical to helping you identify challenges, organize ideas, and brainstorm solutions. Push you to take chances. If there’s one thing creative people love it’s pushing boundaries! And the early stage of brand planning is the perfect time for some creative experimentation. Don’t be afraid to explore new solutions to old problems and take chances that can position your brand for success. Anticipate tactical solutions. It may seem premature to talk about your brand’s website or your customer relationship management strategy now, before your brand has even been launched. But branding agencies are naturally wired to think of creative solutions to strategic problems. It’s never too early to start mapping out your tactical plan and how this plan can tie into your strategic vision. C2 has a wealth of experience in nurturing brands before they enter the marketplace. Want to know how C2 can help advance your brand planning objectives? Contact us today. There’s been a proliferation of graphic design inspiration through various hashtags on Instagram and other social platforms. Many of the design techniques are interesting but most we’d have a hard time applying them in our day-to-day client work. We thought participating in something like #PosterAWeek would be a good outlet for some experimentation. The goal here is to experiment with tools and techniques—not create master works, so we needed to put some time parameters on this exercise. The first rule is to keep the hands on keyboard time to an hour per poster. The second rule is there are no other rules. The first few weeks of the year have been building off of styles that we’re fans of. Moving ahead we’re fine tuning some ideas to carve out our own voice in the #PosterAWeek and #PosterADay stream. Below are a few samples of what we’ve creative to date. A former employer of mine once said “There are no small ideas, just small thinking.” That comment applies here. 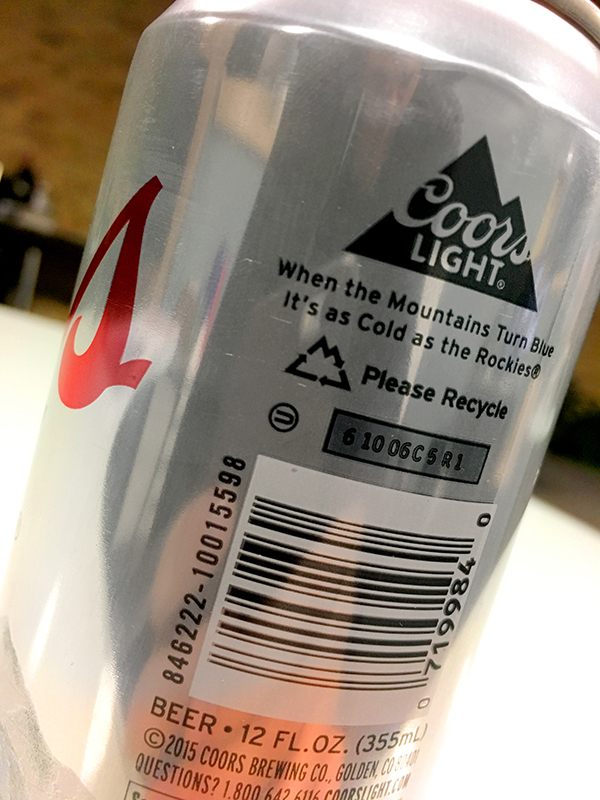 The recycling icon on a this tasty beverage is the smallest of details but this version of the icon has smart thinking behind it. Give that designer and the brand team a cold one! On occasion we’re asked by an inquiring team if we specialize in marketing for not-for-profit organizations. I never know exactly how to answer this. We never set out to specialize in not-for-profit organizations, but over the last four years we’ve done quite a bit of branding, UX, and web development work in this space. We’ve also worked with the American Brain Tumor Association and Common Threads on several of their branding initiatives. At our core we’re a branding, design, marketing campaign roll-out, and development team. We work in several categories including technology, healthcare, construction, and along the way we’ve done our fair share of not-for-profit corporations.